Our next stop in Death Valley was at Badwater. This is the lowest point of land in North America. 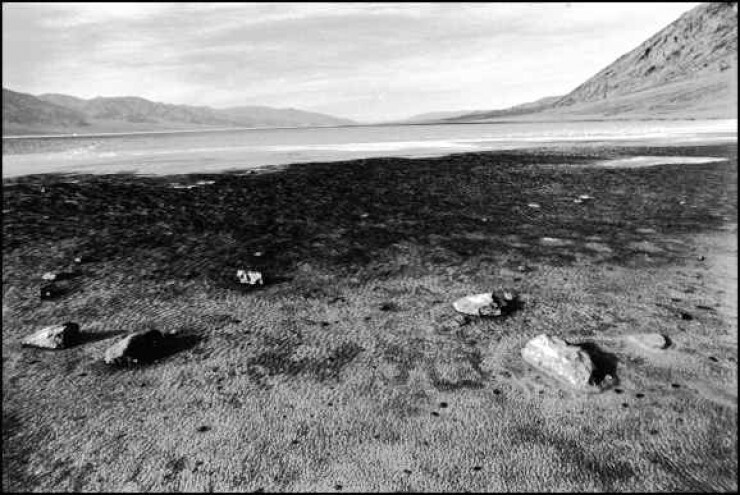 There wasn't much in Badwater except a small pool of briny water. There was a path out across the dry salt lake which we strolled along for a while, picking up a large amount of salt on our boots. Someone had climbed the cliff next to Badwater and put a `Sea Level' sign several hundred feet up so that visitors would know how far they were below sea level. A large aluvial fan spread out next to Badwater. Cindy also pointed out some other geological features that she recognized from studying the guide book.